Professor Elizabeth Martínez-Gibson’s essay “Por la Calle de Alcalá: The Languages Used in Storefront Signs along Madrid’s Longest Street” has just been published in Volume 18, Fall 2016-17 issue of the MIFLC Review. James Riggs, a Biology major and a Portuguese and Brazilian Studies Minor (’19), is a First Year Experience Peer Facilitator and Team Leader, Treasurer of the Portuguese Club, Board Member for CougarCon, Vice President of the Catholic Student Association, Founding President of the Doctor Who Club, and accordionist for the College of Charleston Pep Band, among other activities. His excellence in leadership earned him the college-wide New Student Leader Award in 2016, and for his exemplary performance in the Hispanic Studies’ Portuguese Program, he was awarded the Outstanding Student of Portuguese in 2017. With her first language being Português, my mother was the first in her family born in the USA. Unfortunately, by the time of my interest in our culture, my mother and grandparents were no longer effectively using the language. 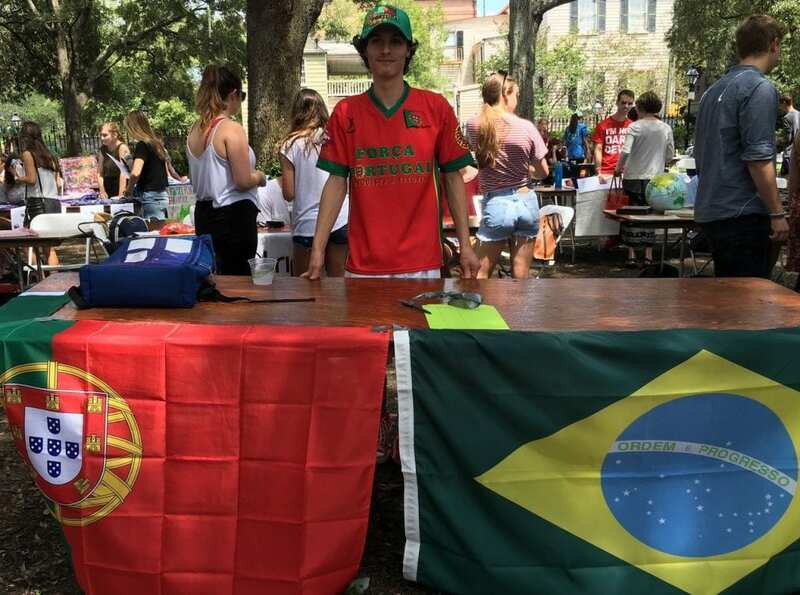 One of the primary reasons that I chose to become a student at the College of Charleston was the offering of the Portuguese language. Despite being able to transfer my Spanish credits from the International Baccalaureate Program, I chose to instead investigate Portuguese. Dr. Luci and Professor José Moreira were most gracious to my desire to learn the variant spoken in Portugal, often pointing out when there were differences between the Brazilian and European dialects. I conducted Duolingo competitions with my colleagues; I have served as Secretary, President, and now Treasurer for the Portuguese Club, and I have worked as a Peer Facilitator for the Portuguese First Year Experience. I am now even able to conduct conversations with my grandparents, and recently my mother, over the telephone! The more I advanced through the courses, the more I wanted students to be able to minor in Portuguese. I started a petition to demonstrate that other students were also interested. After a long process, the Portuguese and Brazilian Studies minor is now available at the College! The Portuguese minor pairs well with my Biology major due to my focus in Entomology. With Portuguese in my arsenal, I will have the opportunity to explore and work with others in the field from around the world, especially in Brazil where the diversity of insects is exceedingly vast. While I have never gotten to partake in a study abroad, by having studied Portuguese at the College of Charleston I finally will have the opportunity, for I will be leaving the country for my first time to visit Portugal with my family in the summer of 2019! 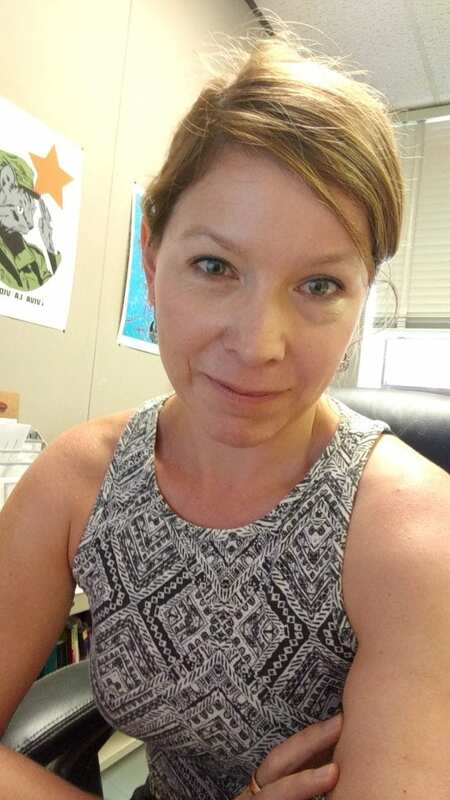 Professor Lauren Ravalico, Ph.D., is an assistant professor of French and Francophone Studies and a member of the executive committee for Women’s and Gender Studies at the College of Charleston. In this article she discusses her research and passion for the Global Foodways program. The Department of Classics at the College of Charleston invites applications for a permanent position at the rank of Instructor, beginning August 16, 2019. We are seeking a dynamic and dedicated teacher-scholar with a committed career track emphasizing language pedagogy who is willing to work closely with undergraduates and to promote the study of classics across the campus and the region (e.g., liaison with the South Carolina Junior Classical league and regional secondary programs). Teaching responsibilities will include Latin (and possibly Greek) at all levels, classical mythology, classical literature in translation, and classical civilization. Promising candidates will have thorough training in both Latin and ancient Greek, extensive experience and demonstrated expertise in teaching Latin, a deep familiarity with established and emerging approaches to language pedagogy, and a strong interest in pedagogical innovation. Excellent collaborative work skills are essential as the person holding this position must be an effective team leader, able to work productively with all members of the department and with other language faculty at the College of Charleston. This is a full-time permanent position with a teaching load of 4 courses per semester. While the position is non-tenure track, the position is renewable for up to five years, at which time the individual would be eligible for promotion to the rank of Senior Instructor. The PhD in classics or related discipline must be in hand by 15 August, 2019. For full consideration, applicants are asked to submit online to http://jobs.cofc.edu/postings/8181 all of the following: (1) a letter of application, (2) curriculum vitae, (3) unofficial transcript (official transcript required at time of hire) (4) teaching statement and portfolio, and (5) contact information for three reference providers who will submit letters of recommendation online by the date provided below. Teaching statements and portfolios should include course evaluations and syllabi and may include discussion of accomplishments in and future goals for working with underrepresented groups and contributing to the growth and support of a diverse community of students and scholars on campus. We are especially interested in applicants with a record of successful teaching and mentoring of students from diverse backgrounds. Review of applications begins on December 1, 2018 and will continue until the position is filled. Select candidates will be invited for preliminary and then on-campus interviews. Questions regarding the position can be directed to Dr. James Newhard, search committee chair, at newhardj@cofc.edu. The Department of Classics has 8 full-time faculty members and enjoys strong enrollments in Latin, Greek, Greek and Roman culture, history, and archaeology. Further information about the Classics Department is available at http://classics.cofc.edu. 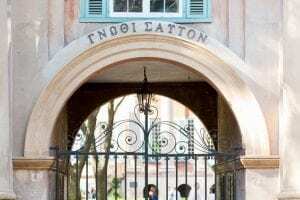 The College of Charleston is a nationally recognized public liberal arts and sciences university located in the heart of historic Charleston, SC. Since its founding in 1770, the College has maintained a strong liberal arts curriculum. The student body numbers approximately 12,000 students in undergraduate and graduate programs combined. The College of Charleston is an Affirmative Action/Equal Opportunity employer and does not discriminate against any individual or group on the basis of gender, sexual orientation, gender identity or expression, age, race, color, religion, national origin, veteran status, genetic information, or disability. After completing B.A. degrees in both Spanish and Anthropology at Iowa State University, Professor Susan Divine earned her M.A. and Ph.D. in Spanish at the University of Arizona, and then spent four years as a faculty member at Westminster College (Fulton, MO) before joining the College of Charleston’s Department of Hispanic Studies in August 2013. Both her prior teaching expertise and her ongoing research have enabled her pedagogical contributions at various levels at the College to include classes on Spanish language, conversation and composition, undergraduate courses on Hispanic culture and contemporary Spanish literature and film, the First Year Experience, and her collaboration with the M.Ed. in Languages program. Complementing her teaching is Dr. Divine’s extensive research on 19th and 20th-century Spanish film, literature and cultural studies that has resulted in articles in leading peer-reviewed journals in her discipline, guest lectures, and numerous conference presentations in both regional and international venues. On the editorial side of publishing, Professor Divine has earned her reputation as a seasoned editor and reviewer with current roles as Managing Editor for both Hispanic Studies Review and Arizona Journal of Hispanic Cultural Studies, Invited Editor for Bulletin of Hispanic Studies, a previous appointment as Technical Editor for Letras Hispanas, and peer reviewer for multiple academic journals, among other related activities. Despite the demands of her teaching and research, Dr. Divine has still managed numerous impactful service contributions campus-wide to include her work on the General Education and By-laws Committees, the Scholarship Selection Committee for Women and Gender Studies, and Student Action with Farmworkers (SAF), among other activities; and her contributions at the departmental level have been equally significant as Co-Adviser of the College’s award-winning chapter of the National Collegiate Hispanic Honor Society, Co-Director of the Maymester Program in Trujillo, Spain and Assessment Reader. Everyday I am grateful that I am at CofC and get to teach students who want to grow as Spanish-speakers and world citizens. From my roles on the college-wide General Education committee, to classroom instructor, to serving as co-faculty advisor to our national Hispanic Honor Society, Sigma Delta Pi, I am able to help students explore their passion, reach their potential, and celebrate the highest levels of their success. I love those classroom moments when students finally understand a difficult concept, or when they make valuable connections between ideas and practice. I am most honored to watch them grow from timid novice to confident speakers of Spanish while traveling through Spain on the Trujillo program.